Residents of Xiamen, a port city in east China's Fujian Province, never expected that "PX," an abbreviation for the word "paraxylene," would have become the hottest word on the tip of their tongues. Both their explanation and courage regarding this term have given birth to another definition -- "Protect Xiamen." In 2006, the Xiamen city government introduced a US$1.41-billion chemical plant project, "the largest industrial project ever in the city's history." Tenglong Aromatic PX (Xiamen) Co Ltd headed the project. They expected to produce 800,000 tons of paraxylene (PX) and generate revenues of 80 billion yuan (US$10.45 billion) a year. PX project site in Haicang District. Paraxylene is a highly polluting, carcinogenic petrochemical used to make purified terephthalic acid, a raw material needed for producing polyester film, packaging resin and fabrics. The planned location of the PX project was in a development zone in Haicang, a district with more than 100,000 residents, where many Hong Kong and Taiwan businesses have invested. The nearest residential area was less than 1,500 meters from the plant, and one fifth of Xiamen island lay within a radius of 10 kilometers. Gulangyu, or Piano Island, the city's largest tourist destination, was only 7 kilometers from the site. About 4 kilometers from the site was Xiamen Foreign Languages School, a senior high school serving 5,000 students, attached to Beijing Normal University. Like many other young people, 30-yea-old Huang Qizhong wanted a home of his own after years of working in this beautiful port city. I want a house with a big French window. The sun would stream down upon the floor and I would bathe in the sunlight. I want a house with a beautiful garden and vast lawn. I would look out upon the blue sky and enjoy the warm breeze. I want a house that faces the sea. I could hear its sound and smell its taste. The Future Coast community in Haicang District. The Future Coast, a so-called No.1 health coastal residential community in southeast China, has no doubt fulfilled all his expectations for a home. Although the community lies in Haicang District, 20 km from the city center and most of the households are migrants, his dream house has an incomparable sea view and a modest price of 4500 yuan per square meter, as compared with 10,000 yuan per square meter and even higher in the city center. 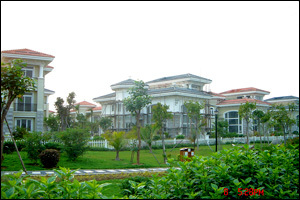 In early 2006, Huang spent nearly all his savings and bought a house there. But soon his dream became an utter nightmare. An awful stench from a nearby wastewater treatment plant and a sour taste from a big chemical plant always make him sick and wake him from his dreams. On May 10, 2006, he wrote about these issues that plagued him and posted this new topic on a local real estate forum. His thread read: "Let us unite and save ourselves and our fruits, our homes." He wrote down his cell phone number at the end of the thread. A tossed stone raises a thousand ripples. On that very day, he received numerous calls from other house owners in his community. They decided to unite and safeguard their rights. Together they did a site investigation of the chemical plant. On May 22, 2006, they sent a letter of complaint in the name of representatives of owners to Haicang District government, but received no response. Then they sent emails to Xiamen City Mayor's Mailbox, but their emails were forwarded to Environmental Protection Bureau of Haicang District; still no response. On July 7, 2006, they sent the letter of complaint by EMS to the State Environmental Protection Administration (SEPA) and the National Development and Reform Commission (NDRC). Later, they tracked the number of the EMS and confirmed that the two departments had already signed for the letter. On July 8, 2006, the NDRC issued an Official Reply of the NDRC on approving the PX plant and its accessory projects with an annual output of 800,000 tons, by Tenglong Aromatic PX (Xiamen) Co Ltd. This document, acquired by the Southern People Weekly magazine, reads: "The NDRC approves the PX plant and its accessory projects by Tenglong Aromatic PX (Xiamen) Co LTD, to provide necessary raw material for the company's PTA project." The document also asked Xiamen Municipal Development and Reform Commission to "accelerate the project according to the approval." According to public reports, the project would bring to Xiamen a GDP of 80 billion yuan (US$10.45 billion), as compared to Xiamen's GDP in 2006 at 112.6 billion yuan. The "big" figure made the house owners feel "small" and desperate. "For us, the best way out is to move away from here, before house prices begin to fall sharply," Huang said. So at the end of 2006, he tried to sell his house but finally he gave up. "The price of houses in other districts is much higher, we can't afford to move," Huang said. Huang's experience epitomizes many other homeowners throughout the country who are trying to safeguard their rights but accomplish nothing. The appearance of an academician gave new hope to those homeowners of Future Coast like Huang. Zhao Yufen, an academician with the Chinese Academy of Sciences, proposed that the plant be relocated to avoid the possible threat of pollution in the future. On March 18, 2007, China Business published an article entitled "Dispute over the safety of the Xiamen PX plant" which said that led by Zhao, who is also a member of the National Committee of the Chinese People's Political Consultative Conference (CPPCC), the country's top political advisory body, 105 political advisors, most of whom are experts and scholars from colleges and universities, submitted a proposal during the annual session of the CPPCC in March asking for the plant to be relocated. Citizens compared it to an "atomic bomb" and sent nearly one million text messages via cell phones to their friends and families urging the government to renounce the project. "The Taiwan-funded Xianglu Group has begun building a PX plant. 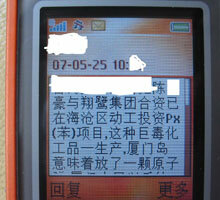 It's like an atomic bomb in Xiamen," read a text message that spread quickly in Xiamen at the end of May. "Many people will suffer leukemia and more babies will be born with congenital defects." "A paraxylene project should be at least 100 kilometers from a major urban settlement, but we are only 16 km from the project. For the sake of our future generations, please forward the message to all your friends," it reads. At the end of the message, it also calls for Xiamen residents to demonstrate in the street on June 1 to protest the project. Even now the source of the original text message is still a mystery. On May 30, the Xiamen authorities put on hold the chemical project, earmarked for the city's Haicang District, 16 kilometers from the city center, after encountering huge pressure from citizens who were virulently opposed to the project. They said the plant would pollute the environment and that it was potentially dangerous. On June 1, nearly 2,000 Xiamen residents took to the streets in a protest march to demonstrate against the plant. The demonstration continued on June 2. On June 3, the Xiamen Public Security Bureau issued a notice asking organizers of the demonstration to give themselves up to the police, saying that they would otherwise be severely punished and even charged for criminal liability. On June 7, the Xiamen municipal government announced that the construction of the chemical project would be decided by an environmental assessment. A month later, the Chinese Research Academy of Environmental Sciences was entrusted by the Xiamen municipal government to carry out the assessment. Li Yanwu, Director of the academy's Center for Environmental Assessment, and his colleagues completed the report late last month. According to an abbreviated version of the report posted on the official website of the municipal government, experts concluded that the southern area of Haicang District, the original location of the planned PX plant, was too small and inadequate for the diffusion of atmospheric pollution. The local government had allocated two targets in the southern part of Haicang. These areas were targeted to develop a sub-center of the city and to create an industrial zone focused on the chemical industry. However, according to the environmental assessment report, urban planners were advised to choose one or the other, but not both. If the city government's priority is the first target, then the area is unsuitable for the development of the chemical industry, the report said. If the latter, a number of residential buildings should be demolished, citizens should be relocated and strict controls over the chemical plants should be imposed, the report said. Lian Yue is a pen name of a columnist who lives on the Gulangyu. "He is our spiritual support," another house owner of Future Coast Wu Yumei said. Lian Yue posted about 150,000 words related to the PX project on his blog since he first reproduced and posted the report by China Business on March 18, 2007. He gave the thread a brief title - "Xiamen Suicides." At that time, this piece of reportage could not be found in any local media except Lian's blog. 1. Don't be afraid. Talking about the CPPCC proposal is not a crime; you won't get arrested. 2. If you have a blog or often visit BBS, please post this news by China Business: "Dispute over the safety of the Xiamen PX plant." It is legal to reproduce and post any news report published by legally published newspapers and magazines on your own blog. 3. If you are afraid, you can tell your friends, families and colleagues the facts and discuss it with them, they might have not known about the project yet. 4. If you are still afraid, then tell your best friend and your family. 5. If you are not afraid, tell your friends in Zhangzhou and Quanzhou cities, because they are also in danger. 7. 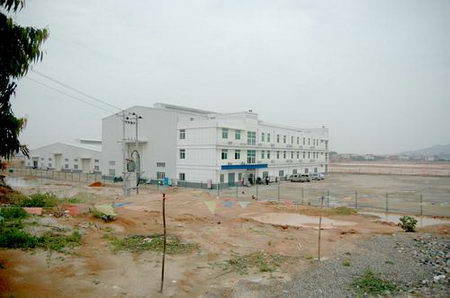 This is a chemical plant opposed by 105 CPPCC members, some of whom are authorities. 8. A PX project should be at least 100 km from the city to be considered as safe. 9. Xiamen residents were deprived of the right to know about the PX project, a fact that proves the project is against the people's will. 10. It will cause an economic recession, property depreciation and a reduction of tourists. Furthermore, Xiamen people will be considered as weak and stupid. 11. Your possibility getting cancer will drastically increase. 12. You don't need to act bravely, just let people around you know the facts; you will not be blamed for Xiamen's future. On May 30, he reproduced and posted on his blog a Xinhua news story that the Xiamen city government had announced it would suspend the project. On June 1, he reproduced a story by China Radio International reporting the demonstration against the proposed plant. During this time, it is unknown that how much pressure he endured but significantly on June 9, Lian changed his MSN signature to: Every word you say is under surveillance. "People live in Xiamen City say no to the project. This is a fact that has been recorded by history. The process of opposition is a great thing," Lian Yue told the Southern People Weekly in an interview. On December 7, he signed up to attend a public hearing held by the local government to hear public opinions on the project. At this time he used his real name: Zhong Xiaoyong. An official from the Xiamen city government, who refused to give his name, said: "The government faces strong political pressure after the June 1 Demonstration," but he refused to specify regarding this pressure. Another senior official from the CPC Xiamen city committee said: "The PX project is different, it was approved by the National Development of Reform and Commission. It is not up to us to decide what to do next." Lin Congming, Vice Director of the city's Publicity Department, told the Southern People Weekly: "The Xiamen city government is an open and responsible government." What Lin said is true if one judges from only one aspect. The city government may indeed be China's most accessible city government. No military guards stand at the entrance and citizens may come and go freely. One only needs to do a simple registration to get into the three office buildings; it's easy to find every senior official's office, even the mayor's office. The Xiamen city government learned an important lesson about respecting the people's right to know. On June 13, Xiamen Mayor Liu Cigui said that the suspension of the project was not due to political pressure from the Fujian provincial government or the central government. He said that if the regional environment assessment report proved the project was not appropriate for Xiamen, the city government would then consider canceling or relocating it. "The government's channel to communicate with the general public is always open. We published much information in local newspapers and broadcast on TV. I think, to some extent, the Internet and text messages on cell phones have twisted the project," Lin said. According to the Southern People Weekly, some local officials still feel regret regarding the project's possible relocation, because it means a loss of possible GDP growth, a factor that still important when assessing local officials. "Xiamen is the second biggest city in Fujian, but its GDP is lower than the third biggest city -- Quanzhou. This puts great pressure on officials in Xiamen. All the cities in China are pursuing quick GDP growth and Xiamen is no exception," said Xu Guodong, a professor with the Law School at Xiamen University. 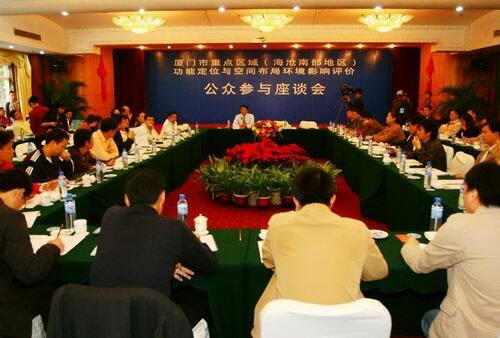 The Xiamen government held two public hearings on December 13-14, 2007, seeking opinions on the project that was suspended on May 30. Of the 107 people selected by lottery to represent the residents of Xiamen at the hearings, 91 opposed the project, 15 voiced their support and one left without speaking. About 80 lawmakers and political advisers also attended - 15 addressed the forum and 14 of them spoke against the government's plan to build the plant. The Beijing News reported on December 19 that the Xiamen government might relocate the halted US$1.41-billion chemical plant to Gulei Peninsula in Zhangzhou, Fujian. Zhangzhou has a population of more than 4.5 million. On December 20, Lian Yue posted a statement on his blog saying that a win-win situation had been achieved. The government has regained the people's support, and people have successfully safeguarded their rights. He himself had finished his job regarding this issue. He stated that he wouldn't accept any further interviews on this topic any more. On December 21, academician Zhao Yufen played down her own contribution and gave all the credit to all Xiamen citizens. Wu Yumei, a house owner of Future Coast, told the Southern People Weekly: "Everything's becoming better. The event is a milestone in China. We are lucky."